Arlington County, VA — just across the Potomac from Washington, DC — is quietly emerging as a leader in the innovative use of technology to create a more bicycle friendly community. Arlington was quick to recognize the value of bike sharing and was thus a leader in the effort to bring Capital Bikeshare, the country’s largest bike sharing system, to the Washington, DC area. But, it’s the adoption of a less visible technological innovation that has made them a technological leader. 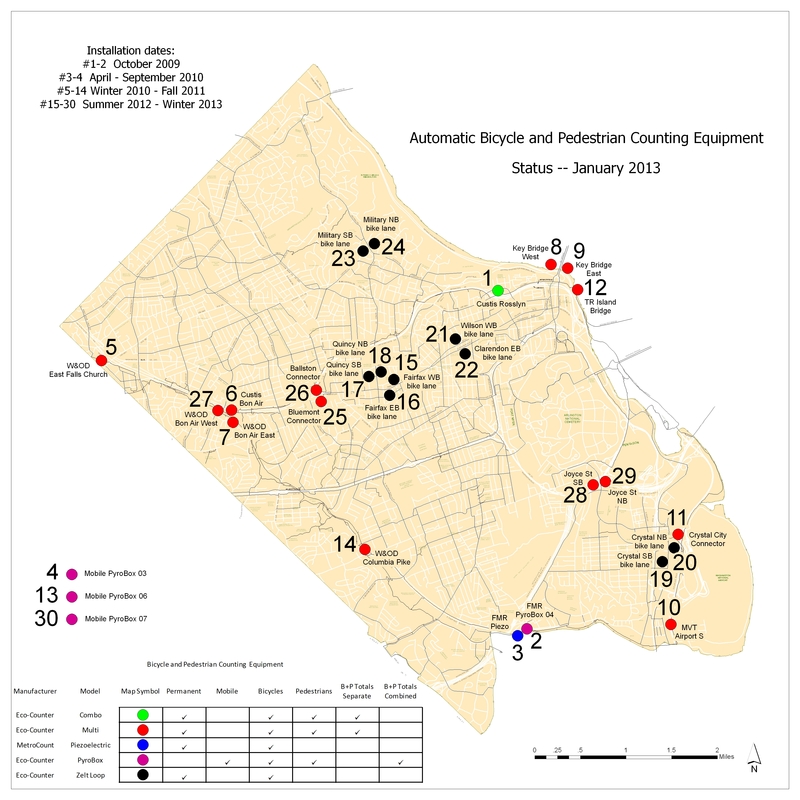 After steady implementation of the automatic counter program, Arlington now has more automatic trail and bike lane counters — 28 in total – than many states. Their bicycle-only piezo counter was the first of its type in this country. Counters are located on each of the county’s major trails, at one of the five main bridges to Washington and in ten county bike lanes. Not only do these counters count users, but some also detect the direction and speed of travel, and distinguish between pedestrians and cyclists. County officials and decision makers now have a robust and growing understanding of how many people bike on county facilities, when they do so and how weather and other external factors change behavior. (For example, there was a spike of pedestrian travel over the Key Bridge after the August 2011, earthquake, when Metro was closed for several hours). This data helps directs policy and funding, and supports the county’s effort to make cycling a viable transportation option for everyone interested. The data not only helps to sell cycling, it helps to improve it. Now that park and transportation staff know the peak trail use times, they can schedule trail maintenance around those times. The county can determine how trail maintenance, new bike lanes and other changes modify bike commuting and recreation. “Now, with as many devices as we have, we can inform many studies, planning efforts, grant applications, and safety investigations — with actual numbers” says Patton. With Arlington on the verge of creating its first green lane — a separated cycle-track along 3300 feet of Army Navy Drive — it is not idle speculation to think that it could become the nation’s first green lane with an automatic counter. And the data from such a counter could show what the impact of separated bike facilities can be in a clear and incontrovertible way.